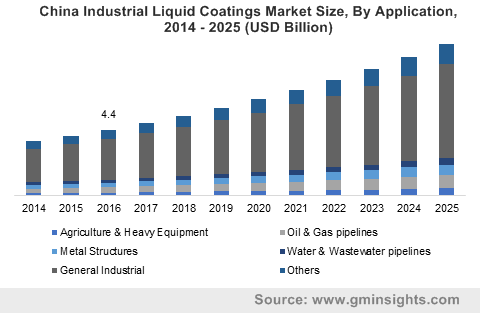 Industrial Liquid Coatings Market size was estimated over USD 45 billion in 2017 and the industry will grow by a CAGR of more than 6% up to 2025. High growth in the U.S. oil & gas sector will propel the industrial liquid coatings market growth in the forecast time frame. Industrial coatings are preferably used in the oil & gas transmission pipelines along with the different equipment used in the drilling and oil production processes. The boom in upstream activities, increasing investments in the midstream sector, and the legislative support given by the new administration will subsequently escalate the liquid industrial coatings demand over the forecast timeframe. Thus, the increase in the production capacity of crude oil in the U.S. will contribute to the product market growth in the country in coming years. 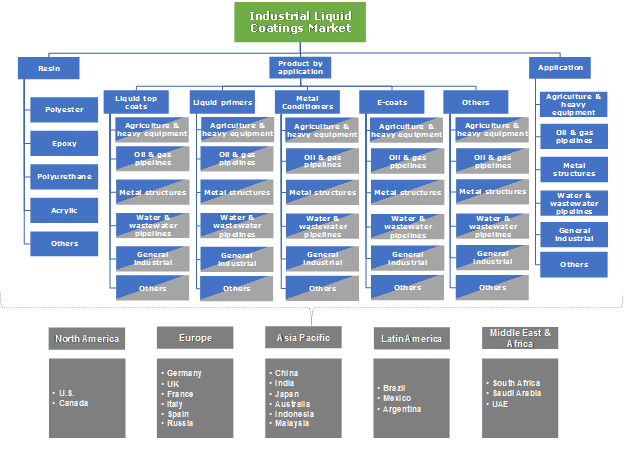 Rapid industrial growth in the Asian countries will propel the liquid industrial coating market growth in coming years, driven by the extensive usage of the product in various industries including food & beverage, oil & gas, energy, electronics, manufacturing, etc. Asia Pacific has been witnessing a robust industrial development in the last two decades with the region accounting for almost 40% of the world output. Automotive, electronics, general manufacturing, and mining activities have witnessed a sharp growth over the last decade. Lower labor prices, easy raw material availability, and rising commodities’ demand have transformed it into a manufacturing hub of the entire world. An adverse impact on the environment and human health caused due to the release of the volatile organic compounds from industrial liquid coatings is the major restraining factor affecting the product market growth negatively in the recent years. Prolonged or high exposure to coating fumes can cause headaches, trigger allergies and asthmatic reactions, irritate skin, eyes, and airways, and put increased stress on vital organs such as the heart. In terms of revenue, epoxy resin occupied more than 30% of the entire industrial liquid coatings market in 2017 and will show a positive growth in forecast period. The product is widely used for their quick drying, protective nature, toughness and other mechanical properties. Epoxy based coatings are comparatively easier to apply than traditional heat cured powder coatings, and this makes it ideal for a various applications. Polyester based coatings market was more than USD 8 billion in 2017 and will rise healthily in coming years. The product is used for sheet fed metal decorating, coil coating and various general industrial applications due to its superior performance, fast drying, corrosion resistance, cost-effectiveness and other chemical resistance characteristics. Based on volume, liquid top coats are the most widely used industrial liquid coatings and holds almost half of the global market share. Superior cure time, excellent chemical resistance, water insensitivity and UV resistance over a wide range of temperature are the properties which makes it widely acceptable in the end use applications. On the basis of revenue, liquid primers held more than 20% of the global industrial liquid coatings market share in 2017 and will show the sluggish growth by 2025. Liquid primers offer excellent anti-corrosive protection, high adhesion, resistance properties to wastewater treatment pipelines and metal structures. In terms of revenue, agriculture & heavy equipment application segment was valued close to USD 2 billion in 2017 and is likely to rise with significant CAGR by 2025. Industrial liquid coatings provide superior ultraviolet rays, corrosion, chemical and mechanical resistance characteristics to the machines used in this sector. General industrial application segment accounted for over 60% of the global volume in 2017 and is expected to show a positive growth rate by 2025. Extensive product usage on the industrial machines and their components in order to prevent them from chemicals, moisture, oil and mechanical stress will positively influence the market growth. North America holds more than 15% of the overall industrial liquid coatings market in 2017 and will also show a decent growth rate over the forecast timeframe. This is owing to the presence of a vast oil & gas industry along with a mature general industrial sector in the region. Combining U.S. and Canada, North America becomes the largest energy pipeline network in the world. This in turn will boost the industrial liquid coatings demand as it is employed in the interior and exterior of the pipelines to protect them from various contaminations, corrosion and to make it compatible to bear the extreme weather conditions. In terms of revenue, Europe industrial liquid coatings market was valued over USD 10 billion in 2017 and is forecast to grow with a significant CAGR from 2018 to 2025. The general industries such as paper & pulp, equipment manufacturing, automobile, electrical & electronics, steel manufacturing, etc. are widely present across the region and extensive product usage in these industries to protect various components, equipments and machineries from adverse operating & climatic conditions. Akzo Nobel, Hempel, RPM International, Axalta Coatings Systems, PPG Industries Inc, The Sherwin Williams Company, Nippon Paint Holdings, Kansai Paints are the key players in the global industrial liquid coatings market. Some of the players are engages in the acquisition and mergers in the industry. For an instance, In December 2016, Akzo Nobel completed the acquisition of BASF SE’s industrial coatings business in order to strengthen its position across the globe. Global industrial liquid coatings market will be primarily driven by escalating growth in the general manufacturing industry. Significant industrial growth in Asian Countries will bolster the entire market as the liquid coatings are widely used to avoid the corrosion related issues in machine and its counter parts of various industries such as electronics, food & beverages, manufacturing, textiles, etc. Significant growth in automotive sector in Asia Pacific and Europe will subsequently boost the industrial liquid coatings market in coming year. This is all due to wide usage of the product for coating the bolts, screws, brake lines, wheel, internal and external body parts of automotive as its offers corrosion, chemical and mechanical resistance characteristics. Such growth patterns in the automotive sector across most of the regions throughout the globe will positively affect the overall industrial liquid coatings market in coming years.